These are some images from the Wakodahatchee Wetlands Park, Florida. Previously the wetlands nature park was part of the wastewater utility property. The Wood Storks were a great bird in this nature park, they were roosting in the trees right next to the boardwalk. It seems the Wood Storks do not mind sharing their space with the Great Blue Heron, Anhinga, and Cormorants. The trees were filled with birds, they did not seem to mind the crowd of people that come to see them. This is a bird I would love to see in real life and these images of your are very good. Interesting to see 3 species nesting together in the same tree. Thanks for hosting Eileen and I hope you have a wonderful weekend. Such fascinating, interesting birds, Eileen! Love that second shot! ...they are a critter that I've never seen before, thanks! Interesting! I've never seen this kind of stork before. Thanks for showing. Really amazing birds...thanks for sharing. Have a nice weekend filled with captures! Photo 4 is my favorite. I hope you can place my link again. I wish you a very nice week. when I saw these guys first time I was dissapointed. I thought they reminded me of vultures. Not as beautiful as storks usually are. The Wood Storks are beautiful birds. I have never seen one before so thank you for sharing these beautiful images of them. Thanks for hosting and have a wonderful day and weekend. After they stopped nesting in far south Florida a few years ago they have returned in large numbers for the past two nesting seasons to Corkscrew Swamp and even to a park not far from my home. They are magnificent birds, and thank for the great photos! A bird which we don't get to see here. Its beak is so long and its neck doesn't has any feather. Happy weekend! Belas fotografias e aproveito para desejar um bom fim-de-semana. What a wonderful and special bird is this. So nice this wood stork. Shot 2 is fantastic with wonderful green colors around. Well done!! These remind me of our ibises Downunder, Eileen. They look very impressive when congregating in flocks! Thank you for hosting, Eileen! It is interesting that in winter they hang out together. I guess all bets are off when migration is required! PS: Have a great new week, Eileen! I've never seen Wood Storks in the wild. They're rather prehistoric looking from the neck up! Lovely feathered friend photos ~ love the fascinating 'Woodstocks' ~ thanks! oh the storks are beautiful and your pictures of them are so pretty!! so cool to see them, they do look prehistoric!! many thanks for hosting eileen, have a wonderful week!!! I remember seeing the Wood Storks in Florida and being amazed at the noise they made as a group! The Wood Storks are very beautiful. Lovely images! That's a good variety. Maybe somebody leaves foo for them in this area so they are all waiting for a handout. Thank you for the Wood Storks . . . I enjoyed seeing the pictures. sub zero temps, wind chill’s hovering 30 and below, everything closed, cabin fever. And more birds than I have ever seen at our feeders. 12 Cardinals one day, zillions of Juncos, Finches, Chicadees, Sparrows . . .
Squirrels, Bunnies, Cleo the cat who roams the neighborhood and woodpeckers too. No doubt other little critters foraging for food . . . this morning I can see all kinds of tracks. Yesterday, we finally were able to get out. All the government offices closed, mail delivery, hospitals, schools, restaurants, stores, etc. Eileen, nice series. Thanks for sharing. Good morning, for once I'm right on time, and this weekend off is especially wonderful. I'm going to enjoy living in Minnesota's winter a lot more than this last week! I know lots of folks think these guys are kind of ugly, but not me, there's something so appealing about them. You captured some great shots of them too. Enjoy your weekend and I hope it's a good weather weekend for you. I supposed they're used to people and each other which is nice to see. I think we need to learn a lesson from the wood storks. You got a great pose in the second shot! Hola!! !..Beautiful images ... Congratulations and happy weekend .. Your second shot is my favourite of the set. What a lovely set of bird photos this week. I also have a special place in my heart for God's creatures, to the point where I sometimes think I get on better with animals than people. Those wood stork heads are just fabulous. Wonderful photos you share here today -- some really special sightings! Love the heads of the storks! Distinctive for sure. Beautiful taking of the Wood Storks, have a happy weekend Eileen. We had one visit us in Virginia in 2017, I think... It was right by the side of the road, in someone's yard... which had a stream in it...I got great pictures...on the blog! Made itself at home for a few weeks. And I believe I heard there was one in the neighboring city this winter! (I am linking up!) Hugs! Wow what an interesting bird. I've never even heard of it. Wow, that is an extraordinary bird. Very nice ! Storks are just plain cool critters. I love how the clack their beaks when they are agitated. What amazing looking birds, nice to see your photographs. Have a Happy February Eileen. Hello Eileen: Sorry not to have checked in for a while but I am away in Costa Rica right now, ironically seeing all of the birds you show above. I will be back home on Thursday and should be back to blogging by the weekend. Oh, my, that is amazing...all those birds in that little area! It makes me smile just to see your photograph. Cannot imagine how you felt being there. It's always a pleasure to see wood storks. Sometimes they hang out in my area but it is never a sure thing, so always a surprise when they show up. Fascinating bird and wonderful photos! My goodness, I didn't realize the woodstorks had such - uh, interesting - faces. Like black vultures. Hi Eileen. The Wood Storks are just great. And it's good to see all of those species sharing such a wonderful place, even if they do squabble a bit occasionally. Thanks for the link today. Happy Sunday. Wow, he is impressive! Such interesting birds. Imagine some parents used to tell their kids that storks brought babies. How silly. We all know babies are found in the cabbage patch. LOL Have a great new week. These storks are magnifient in the trees! Thanks so much for joining us birders at I'd Rather B Birdin this week! What an interesting looking bird..Love the second picture..great shot.. Hope you are enjoying this beautiful day. We could hardly believe all the storks at that wetlands! And were surprised too at how the different species shared the same tree. And we were there when there were babies in the nests! I loved our trip to Fort Lauderdale, thank you for the great pictures and the memories. And for hosting. Have a good week! These birds are amazing. What a great shot of the close up. 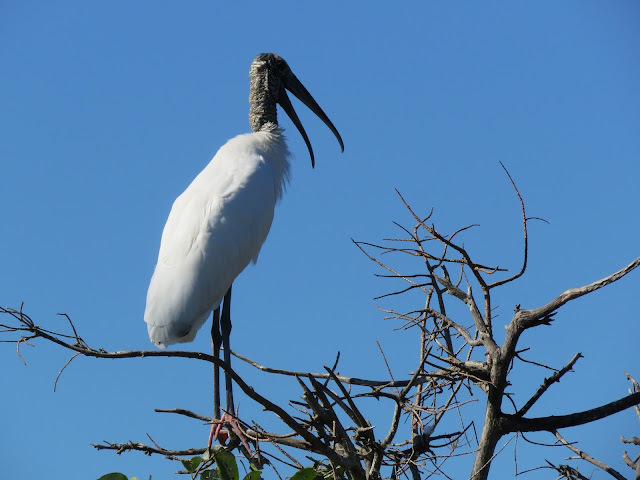 I can see in your blog archive that you've posted about the wood-stork before, but I don't remember them. What cool and intriguing bird to see and enjoy!